Sherlock Homes, Paddington Bear, Peppa Pig... these are among the most popular British franchises among Chinese audiences. And now, audiences in China can expect to see even more creative products that combine British and Chinese cultural elements as enhanced cooperation with China in film and TV is one of the key areas for the UK's cross-boundary efforts in the creative industry, the British ambassador to China told the Global Times on Saturday at the British embassy in Beijing. "We have already got co-production treaties in film and TV with China and I think the important thing is to get both treaties off the ground and produce material so that we can entertain Chinese and British audiences," the ambassador, Dame Barbara Woodward, said when asked about next year's focus in the creative industry during the British embassy's Open Day event, adding that the two nations have reached a "golden era" in bilateral relations. 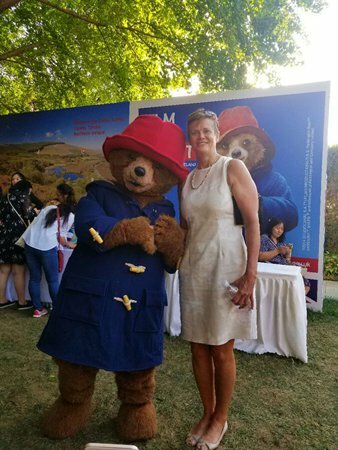 The embassy's fourth Open Day, the event attracted a record number of more than 2,500 visitors that came to see the 55 exhibitors showcasing British culture, education, tourism, food, technology and sports. Popular film and TV icons - Paddington Bear and Peppa Pig in particular - received the most visitors at the event. "A great number of Chinese love British cultural franchises and brands. Take Paddington Bear for example, not only do Chinese families with kids love it, but so too do young women. People's passion for this brand reached a new peak when the second film in the franchise hit Chinese cinemas at the end of last year," noted Chen Xiangning, marketing manager of CAA-GBG, a global brand management group. Chen added that sales of Paddington Bear merchandise are expected to boom in China as this year marks the 60th anniversary of the birth of the popular fictional character. Exchanges and co-productions have been on the rise following the signing of a film co-production agreement between Britain and China in 2014 and a television cooperation agreement signed in 2016. The agreements present a series of advantages in terms of tax deductions, financing, distribution and eased quota restrictions. A string of co-productions made after the agreements were reached, such as Chinese documentary Confucius and Jackie Chan's popular action film The Foreigner, have already won the hearts of moviegoers both at home and abroad. The latest co-produced film expected to become the next big hit is a new animated Peppa Pig movie that will see the titular character celebrate the Chinese New Year. Co-produced by the Entertainment One UK Limited and China's Alibaba Pictures, the film is scheduled to release in the Chinese mainland in February 2019. Peppa Pig has received a warm welcome since the show debuted in the Chinese mainland in 2015. The main character Peppa is one of the most used emojis on Chinese social media.